On September 14, 1957, Ibrahim Sued, a columnist for the Rio de Janeiro newspaper 0 Globo, printed a letter which he had received, concerning a UFO incident. Accompanying the letter were three small pieces of white metal. Thus was ushered in one of the most controversial of all physical-evidence cases. The writer of the letter described an event in which a "flying disk" exploded over the beach at Ubatuba, in Sao Paulo Province. 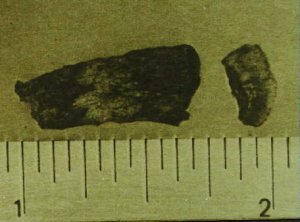 Some of the metal, which had "rained down" from the exploding disk, was collected, and three small pieces were included in the letter to Sued. Unfortunately, the signature on the letter was illegible. Furthermore, the identity of all witnesses to the original seaside event at Ubatuba remains unknown, despite extensive searches by the Brazilian representative of the AERIAL PHENOMENA RESEARCH ORGANIZATION (APRO), Dr. Olavo FONTES. This lack of witnesses is one of the greatest weaknesses of the Ubatuba case. 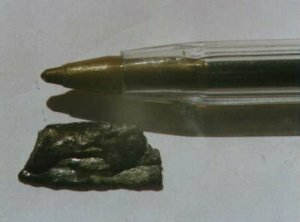 This piece of metal was picked up after a UFO explosion over Toninha's Beach, in Ubatuba, Sao Paula State, Brazil, in 1957. This sample was analyzed and the results showed a 99.99% pure magnesium. This other piece fell down from one of the three UFOs that had flown over the city of Caminas, Sao Paulo State, Brazil, on December, 1954. Tests proved the material to be 88.91% pure tin. Mr. Sued gave all three pieces of metal to Dr. Fontes, who in turn had one of them analyzed at the Mineral Production Laboratory of the Department of Mineral Production in the Brazilian Ministry of Agriculture. Dr. Fontes personally delivered the samples to the chief chemist, Dr. Fiegl, an internationally known specialist. A qualitative, acid test was first made on a small chip, which showed that the fragments were truly metallic. One of the original fragments, designated Sample No.1 by Dr. Fontes, was subdivided into several pieces and two of the pieces were submitted to the Spectrographic Section of the Mineral Production Laboratory Semi-Quantitative Emmission Spectrochemical Analysis. One of the pieces was analyzed by Dr. Luisa Maria A. Barbosa. The analysis surprisingly revealed that the sample contained only the element magnesium. A second fragment of Sample No.1 was submitted to a separate spectrographic analysis by Mr. Elson Teixeira of the Mineral Production Laboratory. Mr. Teixeira confirmed Dr. Barbosa's finding that Sample No.1 was pure magnesium. Further tests were run on fragments of Sample No. 1. These included Debye-Scherrer-Hull powder pattern X-ray diffraction analysis, density measurement, and radiation tests. The significance of Dr. Barbosa's and Mr. Teixeira's findings is that it is impossible to produce any element, terrestrially, that is absolutely spectrographically pure. These results, therefore, are often cited by proponents of UFO extraterrestrial existence as proof that the Ubatuba material must be EXTRATERRESTRIAL. Unfortunately, this supposition cannot be proven, due to the lack of any further Sample No.1 fragments for verification analysis. 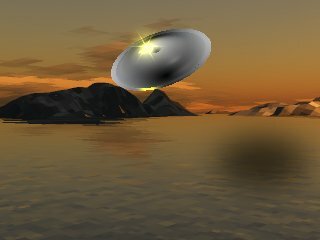 The Ubatuba incident is certainly in need of futher verification, especially the details of the UFO incident itself. All we have is the word of one anonymous person who wrote the letter received by a newspaper. The case itself is dated by the receipt of the letter, and not the incident of the crash, so there are no first hand witnesses to the UFO incident itself.